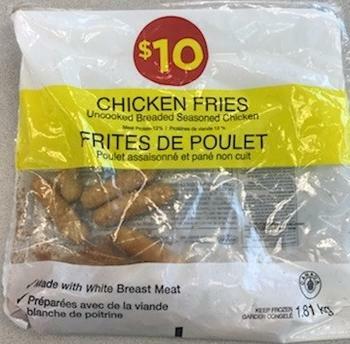 Loblaw Companies Limited is recalling $10 Chicken Fries that may be contaminated with Salmonella. Seven cases of Salmonella Enteritidis illness have been reported in the Canadian provinces of British Columbia, Alberta and Ontario. No deaths have been reported. Customers who purchased the recalled product should not consume it, but discard it or return it to the store where it was purchased. Consumers with questions may contact Loblaw customer relations at (888) 495-5111 or by email at customerservice@loblaws.ca.